Monaghan edged a thrilling Ulster final against Donegal and held out in a gripping second half to win a second provincial crown in three years. Malachy O'Rourke's side led 0-8 to 0-4 at half-time but Donegal took control after the break with Paddy McBrearty hitting five second-half points. Monaghan failed to score for the last 23 minutes and Donegal came from five points down to move within a point. McBrearty's shot in the third minute of stoppage time dropped narrowly wide. Monaghan will play an All-Ireland Senior Football quarter-final on 8 August while Donegal will play Galway in a fourth-round qualifier in two weeks' time. Tyrone will be strongly fancied to beat Sligo in the other Round 4B qualifier after Sligo lost to Mayo 6-25 to 2-11 in the Connacht decider. Donegal kicked 11 wides in the second half, but got that one chance to grab the equaliser, the in-form McBrearty just off-target. In front of 31,997, it looked good for Donegal early on, and they were two points ahead after only two minutes after McBrearty and Karl Lacey kicked scores from play. McManus responded with a fourth minute free but Donegal reasserted their early grip on the game when Frank McGlynn cut inside to score with his left foot to put Donegal 0-3 to 0-1 ahead after five minutes. Manager Malachy O'Rourke and players Darren Hughes and Conor McManus give their reaction after an exciting win over Donegal in the 2015 Ulster football final. Incredibly, that was their last point from play in the first half as Monaghan took complete control of the game. Donegal had to wait 28 minutes for any kind of score, with Murphy's 33rd-minute free their sole response to the Monaghan onslaught. After McGlynn's point, Monaghan outscored Donegal by 0-7 to 0-1 in the opening half with their work-rate forcing Donegal into uncharacteristic turnovers. Karl O'Connell popped up from wing-back to score in the ninth minute and McManus' tap-over free had them level at three points each after 15 minutes. Monaghan supported each other in numbers and grew in confidence with every turnover. Owen Duffy, Kieran Duffy, McManus and Dessie Mone all kicked points from play as the Farney county put clear daylight between the teams. Malachy O'Rourke pumped his fists after one inspirational turnover Ryan Wylie, who dispossessed Christy Toye and fed McManus, who slung the ball over the bar. 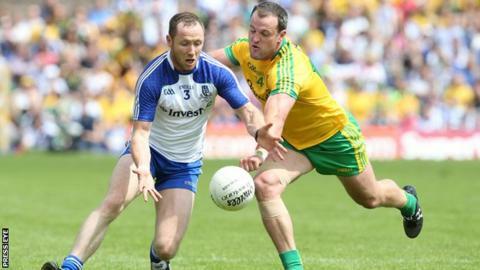 Donegal manager Rory Gallagher admits his side were guilty of not taking their chances as they lost to Monaghan by one point in the Ulster football final. Donegal hit three wides in the first three minutes of the second half and Monaghan, in their first attack of the second half, pointed through Owen Lennon to push their lead out to 0-9 to 0-4. McBrearty pointed two frees after fouls on Ryan and Mark McHugh and Donegal's dominance around midfield began to tell on the scoreboard. However, their wides racked up with Colm McFadden, Martin McElhinney and McBrearty snatching at chances. McManus got the better of Neil McGee on several occasions and pointed an excellent score in the 50th minute to leave Monaghan 0-11 to 0-6 ahead. That was their last score of the game with Donegal dominating possession but the wide count hurt them. Michael Murphy switched briefly to full-forward and made one great catch, which led to a score, but a shocking tally of 11 second half wides finally caught up with Donegal. A number of their key performers under-performed but they should still be a potent force in this year's All-Ireland series.